Sam joins from Landwood Group (Chartered Surveyors) where he was responsible for commercial and residential property sales and asset management for the previous two years. “We are delighted to have Sam join us as Management Agency Surveyor to let as many of the voids within our substantial managed property portfolio. He will provide our Management clients with a dedicated Agent to ensure we retain as high an occupancy rate as possible and offer a top class service. As part of Sam’s recruitment, James Goode now fronts our private treaty agency side of the Department. 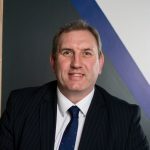 This gives us the sound foundations on which to build for the coming years and in an improving commercial property market.” commented Stuart Cooper, Director at Roger Hannah & Co.